As a man, have you ever wondered why most women’s wardrobes are filled with diamond jewelry instead of gold? What exactly do they adore so much from them? 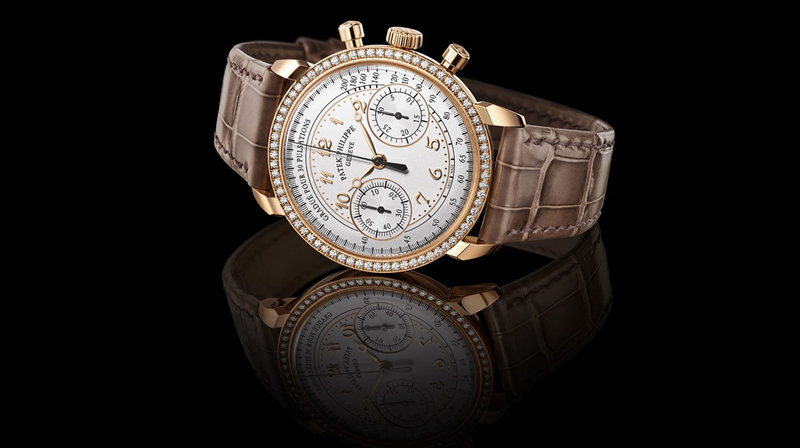 Why would Ellen DeGeneres care less if the Patek Philippe 5271P-001 Grand Complications watch is for the men or not? Well, it’s simple. Diamonds sparkle is divine. Their brilliance is long-lasting. And it’s not just a jewel to them but a symbolic ornament that adds a unique title in their secretive memoir which they release only in their old age. Although no one doesn’t like a diamond’s shine nowadays, today it’s about glistering our ladies’ wrists with sparkles of top Patek Philippe diamonds watches for women. Only should you take care not to go blind from their stare. If I were to categorize this Patek Philippe Calatrava watch, my instincts would have placed it in the classic collection. Its white lacquered dial has no much complications on it apart from the rose gold hands and hour markers. However, since the hour markers are not even the ordinary ones we see on most wristwatches, and the casing is as shiny as the new moon. 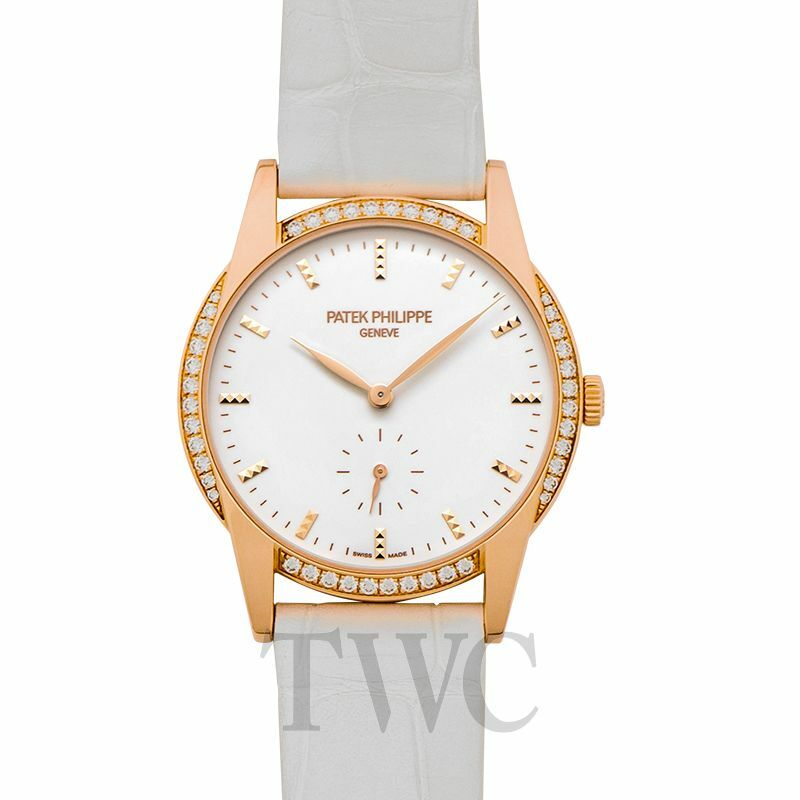 I believe the Patek Philippe diamond watch would fit in its own classic collection which will bear its own golden name. On the exterior casing, Patek Philippe 7122/200R features a 33mm rose gold case that has an external bezel set with 44 diamonds. The PP watch has an antireflective sapphire crystal on the front display, as well as the caseback. This allows you to enjoy the view of the silvered and golden jewels as they move harmoniously in order to give you a punctual tick. For optimum uniformity, this ladies’ Patek Philippe Calatrava model has matte white alligator skin straps which conform with the white dial seamlessly. Since precision is still as much essential as its striking elegance, the 7122/200R watch runs with a manually-wound Caliber 215 PS movement. From its frequency of 8 beats in every second, this movement presents its wearer with a precise hour and minutes function with the central hands. While the seconds are displayed at the subdial at 6 o’clock. Did you think only mens diving watches are there? Absolutely no! Patek Philippe not only have one for the ladies, but one with diamonds as well for surprising the colorful saltwater fish with its own splendor. Patek Philippe Aquanaut 5067A-024 is predominantly defined by its aquatic nature which allows it to breathe with you even at an underwater depth of 120 meters. This is enhanced by its sturdy silvered stainless steel case that has a girth of 35mm and a fixed bezel with a gem-setting of 46 brilliantly-cut diamonds. To enhance its robustness even in the saltwater sea, the steel case has been added with polymer bands which have been embossed as well to conform to the dial. 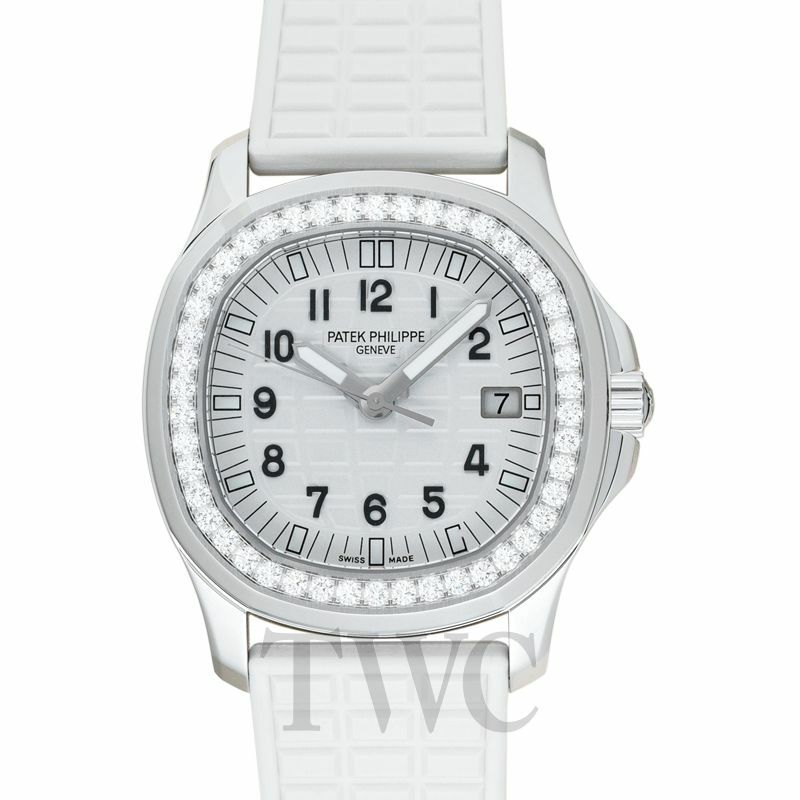 As a casual Patek Philippesports watch, 5067A-024 Aquanaut Ladies Watch has an embossed “Glitter white” dial and silvered luminous hands for easy readability in dark environments. Using its electronic caliber E23-250 S C movement, this wristwatch never let you be late on your date. It supports hour, minute, and seconds precision at the center hands, and the date display at the 3 o’clock aperture. Dissimilar to other quartz watches which are usually low-priced, Patek Philippe Aquanaut 5067A-024 falls in the category of the most expensive watch brands. Following its price tag that plays at no less than $20, 000. Back to our ladies who cherish classic designs, it’s time to try this diamond watch for women blend which features an ultra-luxurious sporty design, alongside a modish classic display. As one the prestigious Swiss luxury watches for the women, Patek Philippe Nautilus 7118/1200R features an exterior casing in Rose gold and a fixed bezel. For extra elegance, this golden bezel has a fixture of 56 brilliantly-cut diamonds all around and an opaline embossed dial with gold applied numerals and hour markers. To enhance the readability of the watch in dark backgrounds, both the hour markers and the hands have a luminescent coating on the top. For the precision, Patek Philippe Nautilus 7118/1200Rhouses a 29-jewel Caliber 324 S C self-winding movement inside its 35mm case. This mechanism enables it to reserve power for up to 45 hours, whilst providing multiple functions of hours, minutes, seconds and date at a frequency of 28800 vph. As a diamond watch for women, this Patek Philippe model has a 35mm white gold case with a total of 185 diamonds (including 36 diamonds on the crown) and 182 blue sapphires. In the inner casing, the white gold dial plate has an etched mother of pearl, then set with 98 diamonds and 89 blue sapphires. In general, Calatrava Haute Joaillerie 4899/901 is more of an ornament with a total of 702 gems, including the 65 diamonds and 82 blue sapphires on the buckle. This doesn’t mean the watch is non-functional though. At its core, the watch model has caliber 240 self-winding movement which displays hours and minutes precision at a frequency of 6 beats/ second. The case back display is as clear as the front one, with both featuring a sturdy scratch-free sapphire crystal that can keep out water for up to a 30-meter depth.